The nominations deadline has been extended for the NICHE Top Retailer Awards competition. Use this ballot to tell NICHE magazine about retailers, museum stores, guild shops, nonprofit stores and others who sell your handmade products. Each year, NICHE honors retailers who support and mentor fine craft artists from the U.S. and Canada. Top Retailers are not always the biggest sellers. They are the retailers known for fair business practices. They treat artists with respect and promote made-in-America and made-in-Canada fine crafts. For more information and a look at past winners, see www.TopRetailerAwards.com. Vote today. Tell your friends. Honor the galleries who sell your work. The new nominations deadline is April 30, 2010. Rugs, taxes, events & inventory... oh my! 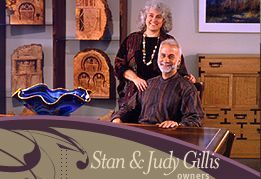 Owned by Stan and Judy Gillis since 1971, The Real Mother Goose has grown from one tiny shop in Vancouver, Washington to three Portland, Oregon locations with over 10,000 square feet of contemporary fine American craft. Part gallery and part retail shop, The Real Mother Goose has one goal: bring the best work by American artists and craftspeople together with friendly, personal service in an attractive and comfortable space. The Real Mother Goose is a NICHE magazine Gallery of Honor.